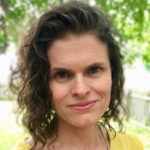 Lindsey Lusher Shute is a Co-founder of the National Young Farmers Coalition and was Executive director from 2010-2019. She is also host of the Young Farmers Podcast. An Ohio native, Lindsey first developed her love of farming on her grandfather’s land in the rolling hills of Appalachia. As Executive Director of Young Farmers, Lindsey grew the organization from a few volunteer farmers to a nationwide network with 40 chapters in 39 states and a grassroots base of over 120,000. Lindsey has edited and authored nine reports for the Coalition, including Building a Future with Farmers:Challenges faced by Young, American Farmers and a Strategy to Help Them Succeed . This report established NYFC’s policy platform and was the first to survey the nation’s young and aspiring farmers. Farmland Conservation 2.0: How Land Trusts Can Save America’s Working Farms and a New York Times op-ed, “Keep Farmland for Farmers”, launched a national land access campaign that has engaged hundreds of land trust professionals in protecting the country’s working farmland. Lindsey regularly speaks at conferences and to national media on farm issues, and was recognized as a “Champion of Change” by President Barack Obama. She was a recipient of the Glynwood “Harvest Award”, was named among “ 20 Food Leaders Under 40” by Food Tank, and an “American Food Hero” by Eating Well Magazine. Lindsey holds a M.S. in Environmental Policy from Bard College and a BFA from New York University. Lindsey and her husband, Benjamin, own and operate a 900-member CSA farm in Columbia County, New York.